Ticks are becoming more and more prevalent in North America, and they’re now being found in areas where people and pets didn’t previously encounter ticks. These parasites aren’t just a nuisance, they can cause serious, and sometimes deadly, diseases. These include Lyme disease, Rocky Mountain spotted fever, babesiosis and ehrlichiosis. Generally in our area of Windsor, Lyme disease carrying ticks (Ixodes scapularis) numbers have been rising in the last few years. If you find a tick on your pet, you can call us to discuss the next step. We recommend that you bring the tick in with you for us to help identify the tick species, and determine your dog’s risk. Contact us immediately if your pet starts coughing, has joint pain, trouble breathing, fever, weakness, loss of appetite, weight loss, decreased energy or coordination. You can keep ticks off your pet by keeping your dog on a tick preventive. Tick preventives are safe and effective at controlling ticks and the diseases they carry. Call us to get your pet protected today! Don’t panic if you find a tick on your dog or cat, even if your pet is on preventive medication. Some preventives kill ticks after they’ve come in contact with your pet. 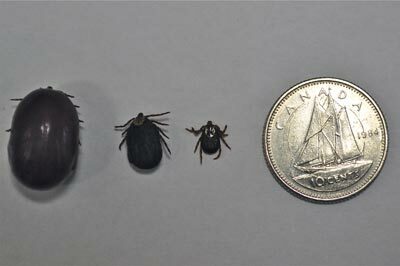 Ticks can hide under your pet’s fur, so as an added measure of protection, we recommend checking your pet for ticks every time your pet comes in from outside. Ticks can easily be removed, although the important thing to keep in mind is to ensure removal of all the tick, including the buried mouth parts. There are special tools that can be purchased called tick twisters. These tick twisters assist in complete removal of these pests. There is also a Lyme vaccination available for dogs, to allow for the dog to have antibody protection to the Lyme organisms in case of exposure. Please don’t hesitate to call at 519-969-7390 with any questions you may have.